Do you enjoy Instagib? Want to test your mettle against other players? Join the upcoming instagib+hook 1v1 duel tournament, hosted by Clan.exe. Hopefully we’ll have players of a varied skill level so that there’s something for everyone. 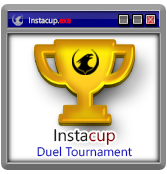 The final scores of each player will determine their “unofficial” instagib duel rank. In contrast to Xonstats’ rankings, the results of the tournament will give a clearer image of how players compare against each other. The format of this tournament means that every competitor will have several matches with different opponents. 20:00 - 22:00 CET each night of the tournament. We’ll play a to be determined (Depending on how many people enter) amount of rounds each night during the tournament. If you don't want to use Challonge, then feel free to apply via this thread, and we'll add you to the player pool. The servers for the tournament will be put up closer to its starting date. They'll be hosted by Clan.exe. Clan.exe servers. Instaduel, Instaduel 2, Free For All Instagib - can be used for training. Download these maps from Xonotic.co if you want to check them out, or practice. The maps will be chosen via cointoss/map veto. If a player doesn't turn up for their match, without alerting anyone, the match point is awarded to their opponent. We expect players participating in the tournament to play fairly and respect their opponents. We'll try to set up a livestream for the tournament and record the demos of all matches. Each match is one round, on one map. Good stuff. I've always wanted to try out the Swiss system. Are the matches Best of 1? Maybe allow people to sign up via this thread or PM too, if they don't want to create an extra Challonge account. Hit me up if you need any help! Also I'll try to take part. TheDefiant pointed me to this tournament yesterday. I signed up too! just a reminder that the Instaduel tournament is starting on Friday (8PM CET), so we're now in the process of finalizing things. The absolute deadline for people to register for pariticpation will be on Thursday, after that we will have the final seed numbers, and everyone will be given their first opponent. Feel free to remind people who have shown interest in joining, but haven't signed up yet. Hopefully it all goes smoothly, and everyone participates In good faith - it should be a lot of fun. The map pool has been finalised, and these are the 9 maps which will be played. For the matches, They'll be chosen via coin toss/map veto. Honestly I would have played but the timeframe just doesn't work for me. I have issue for friday match. I will not be able to make it. Is there any way we can do it on saterday? Your opponent for the first round is Cobra. I think, for situations like this, we'll have it so that if your opponent agrees to a match at a different time, then that's perfectly acceptable, providing the match happens before the next round. (Before 8PM the following day). Speak to Cobra and see if you can agree on a reasonable time for your match. As a note, could people please enable auto recording of demos on their client, so that these can sent to us and published - as well as being evidence of how the match went. The tournament nearly here, and I want to say thanks to everyone for the interest shown in it. Hopefully we have a friendly, clean tournament, where people show respect towards their opponents. if it all goes well, this could become a regular thing. Packer has agreed to stream matches from the tournament, the stream can be found here. Due to a recent change in my work schedule, I will be unable to attend this sexual gathering. I will check with Cobra (question is how...). I can schedule the match before 8pm next day if he can make it. Quite a few people didn't turn up for the tournament, including Cobra. We've had to rearrange the brackets, and as it turns out Kwakkie, you're my opponent. What time do you want to fight tomorrow? Let me know, and I'll be there, on the Instacup server #1. Hey all, apologies for leaving you in the dark. I saw Kwakkie's message in the mail, but replying directly to Challonge's email doesn't work. As I was late at work and I generate my passwords, I had no way to access any of the relevant accounts from there. I hoped, seeing Kwakkie's email, that me not showing up was sufficient hint that tomorrow i.s.o. today is fine for me. Now I see that due to other people not showing up you guys were taking more extreme measures. We'll be having play-offs to determine the final positions for the top 6 players. Grand final: Winners of semi final rounds. It'll be best of 3 matches, with the grand final being Best of 5. Hey kougi. For sure I will not be available before 20.30. Besides, can you please put the Pukka3tourney2 map on the servers. Who made the selection. I would have liked Hands of God to have been added. (10-24-2017, 03:12 PM)kwakkiezalf Wrote: Hey kougi. For sure I will not be available before 20.30. Hi. Kwakkie. Thanks for pointing that out, we need to update maps on the tournament servers. Meanwhile, Pukka3tourney2 is available on the InstaDuel server, you can practice it there (settings are the same, except footsteps are disabled). Thank you for organizing this duel tournament. I had great fun in most of the duels, with shaking hands after the games! I hope you guys do it again next year.